Antalya (Greek: Αττάλεια) is a large town and tourist destination, situated on the Mediterranean coast of southwestern Turkey. It is the capital city of Antalya Province. The population of the city is 603,190 (2000 census) but reaches up to two million in summers at the height of tourism season. Situated on a steep cliff over the Mediterranean, Antalya is a picturesque city surrounded by mountains. Developments in tourism, starting in the 1970s, have transformed the city into an international resort. With its airport and central location, Antalya is "the capital of Turkish tourism", a gateway for the Turkish Riviera and many historical sites. Furthermore, with its palm-lined boulevards, its prize-winning marina, the unspoilt historical neighbourhood of Kaleiçi, and the modern developments along the coast, the city of Antalya is a major attraction in its own right. Antalya and its surroundings are a very important part of Turkish tourism. 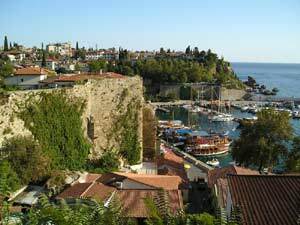 Antalya city corresponds to the lands of ancient Pamphylia to the east and Lycia to the west. Antalya has plenty of accommodation, a very hot climate and many places to visit both in and around the city, including traces of Lycian,Pamphylian, Hellenistic, Roman, Byzantine, Seljuk and Ottoman architecture and cultures. Atatürk claimed without doubt Antalya is the most beautiful place in the world. The city of Antalya stretches along the bay bearing its name, and is built at 39 meters altitude on a rocky coastline. One is immediately struck by the Taurus mountains rising to 3086 meters above this coastline, intersperesed withvalleys of varying sizes. Land and sea everywhere meet the beaches stretching for miles or the steep cliffs. The Taurus mountains against the blue backdrop of the sky, the precipices and especially the caves close to the sea add another dimension to the beauty of the region. All you want to know about Antalya!